It is no surprise that the U.S. pork industry is growing. Production increased 7.3 percent in 2015 and 1.8 percent in 2016, with expected bumps of 4 percent this year and 2.3 percent in 2018. This equates to annual growth of over 4 percent for the four-year period. Total 2018 U.S. pork output of 26.58 billion pounds, carcass weight, will exceed the PEDV-shortened 2014 total by 16.9 percent. Two things drive growth in any industry: Resources and profits. Resources pork producers need include capital, management, labor, and production inputs, such as feed. One could argue that labor is a limiting factor in some locales, but the other factors are in good supply. Corn, soybean meal and lean hog futures suggest 2017 profits of just under $9/head on the Iowa State University Estimated Costs and Returns series – the best since 2011. June 1 futures contracts for 2018 point to similar profits. The packing sector is quickly solving a growth constraint by adding a substantial plant capacity. The Moon Ridge Foods pork plant in Pleasant Hope, Missouri, and the Prime Pork plant in Windom, Minnesota, are not yet up to announced capacities, but the latter opened in late April. Triumph-Seaboard’s plant in Sioux City, Iowa, will begin operations in late July and expects to be up to full one-shift capacity near the first of the year. Clemens Food Group’s Coldwater, Michigan, plant will open Sept. 5 and expects to be at one-shift capacity by February 2018. In May 2018, Triumph-Seaboard will add a second shift. Finally, Prestage Foods has broken ground on its Wright County, Iowa, plant, with plans to open in October 2018. When it reaches capacity sometime in 2019, the pork industry will have nearly 10 percent more capacity than in the fall of 2015 and over 9 percent more than just last fall. Growing supplies, coupled with new plant capacity to process pigs provide an export opportunity. This year’s surprising rise in exports has buoyed pork and hog markets in spite of record-large output. I’m not aware of any analyst who forecasts anything close to the 17 percent export growth we have seen through March. Exceptional sales to Mexico, Japan, Korea and other markets helped market hog prices exceed expectations back at the first of the year. U.S. exports should nearly match last year’s levels for the rest of 2016 and break the 2012 record. Counting on domestic consumption to take a large share of the coming growth is risky. The U.S. population has grown only about 0.7 percent per year since the beginning of the Great Recession. Per capita pork consumption averaged 51.0 pounds from 1988 to 2007 (before corn-based ethanol and PEDV). Forecasts for 2017 and 2018 are 51.2 and 51.9, respectively. If exports underperform and U.S. production increases enough to fill the new packing capacity, per capita availability could easily exceed 53 pounds. That would likely put significant pressure on pork and hog prices. Nothing says that the new capacity must be filled, but most of it is owned, at least in part, by hog producers who will see better financial performance of their integrated system if the plants run at high capacity. The economic incentives will be high to increase hog output. 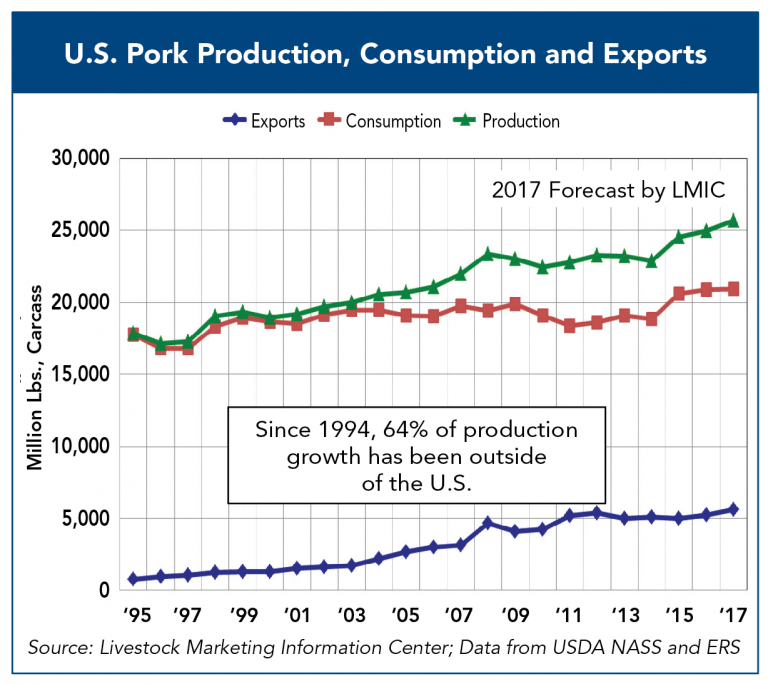 As this trend continues, it will be imperative for pork marketers – including the Pork Checkoff – to continue to increase pork demand around the globe and here at home to keep prices high enough to support profitable production. Who Are These Auditors Coming on My Farm?